Young people from across the Borders region are called on to have their say and join the free creative workshop which takes place on Saturday 1 December from 11am to 4pm at the Scottish Public Pension Agency in Galashiels. What do you love about your region of Scotland? What makes your region of Scotland unique? What symbol best represents your region of Scotland? These are the questions tackled by the young people of the Borders, together with their peers across the country in a series of creative workshops to select a symbol which best represents their region and captures the collective burning heart of Scotland as part of #ScotArt, marking the end a fitting finale to Scotland’s Year of Young People 2018 events programme. 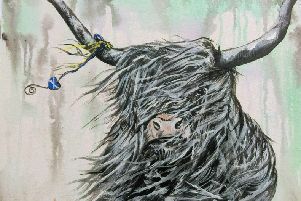 Young people from across the Borders region are called on to have their say and join the free creative workshop which takes place on Saturday, December 1 from 11am to 4pm at the Scottish Public Pension Agency in Galashiels to decide which #ScotArt symbol best captures the spirit of their region. The fun, interactive, artistic workshop is led by Borders #ScoArt Young Champion Rebecca Tait and Young Artist Regina Franca alongside Scottish-based artist Ariel Killick and young people in the area to explore what their region means to them and how best to sum that up in one symbol, followed by a creative session on the methods and materials used in wire and wicker sculptures and the chance to create their own piece of art to take home. Edinburgh’s Hogmanay has recruited Young Champions and young emerging artists from across Scotland to co-lead creative workshops of young people from each region to conceive of and help design 14 symbols which they believe best encapsulate each of their regions. The 14 regional symbols will then be made into giant wicker sculptures by artist Ariel Killick. These incredible sculptures will be displayed on Edinburgh’s Royal Mile from December 21-29, after which they will be placed as the focal point of Edinburgh’s Hogmanay Torchlight Procession finale on December 30. Young people who are unable to attend the workshop can also still have their voice heard by submitting their #ScotArt symbol online. If you are aged between 8-26 and would like to be part of this amazing Year of Young People finale project and help choose which symbol represents the beating heart of the Borders sign up at www.scotart.edinburghshogmanay.com or by contacting bruce@underbelly.co.uk directly.